“You’re invited back to the ranch, you in?” My best friend Andy texted. I hesitated. Most hunters wouldn’t think twice before saying yes. Hunting Texas quail and predators on a 180,000 acre private cattle ranch is a once-in-a-lifetime experience for most. It’s a place where they filmed “No Country for Old Men”, near the border of Mexico. You just drive 10 hours southwest of Dallas, Texas to the middle of nowhere, take a left on an unmarked gravel road and then go an hour further. I had been once before. “Epic manventure” is an understatement. The issue at hand was that I'm a public–land-hunting snob. I grew up hunting public land in Oregon for big game and birds, where competition is fierce, game is wary and the phrase “hunting” is, and should be, synonymous with “suffering”. My dad and I have been hunting the backcountry for as long as I can remember, where survival planning is as essential as hunt planning. When I do hunt private land, its only after proper scouting and door-knocking to ask permission from the landowner. You see, there is an unwritten code: earn where you hunt, then what you hunt. Guided hunts, private land invite hunts, and public land road hunters all violate the code. But, since this was Marfa, Texas, I threw my snobbery out the window and replied “HAIL YA BROTHER I’M IN”. In 2014, Texas had one of the worst droughts in state history and the quail reports from Marfa were equally terrible. The next year record rains ended the drought dangerously fast and set the groundwork for fertile fauna production. 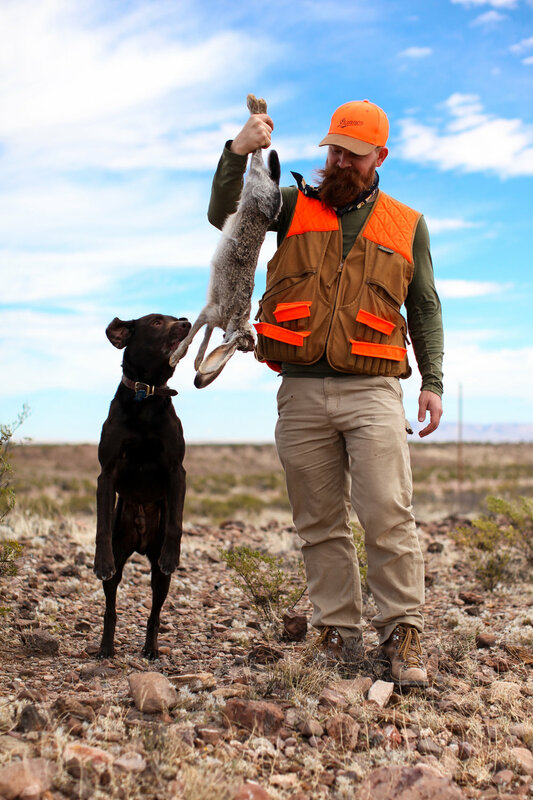 The targeted species for this year’s hunt were quite simply “quail and predators”, which includes coyotes, bobcats, fox, javelina, feral hogs and, of course, suicidal jackrabbits…which commonly jump into the grill of the truck as you drive along. All, of course, in a vast desert setting that is reminiscent of old western films, where bad guys hide in the rimrock and good guys ride out in the open. The chosen hunting method, on this cool February weekend, started with cruising primitive ranch roads in a farm truck. This is no ordinary hunting vehicle though, as it has bench seats welded to the bed, tricked out with long-gun holsters for quick access to rifles and shotguns. Who wants to walk 180k acres when you can drive it? Oregonians, I guess. Maybe it’s that Oregon Trail pioneer bloodline. Meriwether Lewis was my first cousin, 10x removed… true story. Well I went with it. The old guys, Andy’s dad and father-in-law, rode inside the truck while Andy and I stood on the back with my bird dog Milo, who I flew down there against the will of my wife. Anything to create an epic experience, I reasoned. When we spotted quail from “the tower” we’d tap the hood of the truck vigorously, stop, load up and get after them. That’s when the fun began. It was never a “get out and shoot” type of deal. The scaled quail, locally called “blue quail”, would usually covey up and bust when we stopped, flying 100-300 yards from the road. We’d mark their location and walk a line in anticipation. All sorts of nasty cactus dotted the landscape and required us to frequently look down as we kept our mark on a hurried stride. Covey sizes ranged from 20-80 and after the first shot, the birds would split up and we’d break off into pairs or go solo after them, sometimes staying on one covey for an hour. These quail preferred to run instead of flush, making us earn every single one in a panting pursuit. We chased quail across some incredible and varied terrain: flat gravel bars peppered in mesquite, boulder-covered hillsides and rimrock peaks – all of which were covered in cactus and within eye sight of the majestic Chisos Mountains and further south, Mexico. At the end of each day we built a mesquite wood campfire at the ranch house and replayed the day’s events. We also pulled cactus from the dog and our own sore bodies. One particular cactus needle penetrated Andy’s foot a full inch through a pair of non-Danner boots. We ate bacon-wrapped quail on jalapenos, some of which were secretly spiked with local habaneros. Talk about pain…oh my goodness. When “Death, Taxes and Habaneros” gets published don’t even read it. With that, hunting became synonymous with suffering. And I liked it. SETH PATTERSON is an Oregon native and first cousin of Meriwether Lewis. He grew up hunting and fishing with his dad in the Willamette Valley and Eastern Oregon, where he gained a deep love for the high desert. A father of 3 and husband to Amy, he has a profound interest in giving people outdoor experiences that re-shape their perspective on life. Sounds heavy, but spending so much time in "God's Country" has turbo-charged his passion for all things outdoors. Newer:In the Heart of the Wallowas Older:5 Days. 5 Hikes.